[In our ongoing feature '5-Breakthroughs' we invited today Prof. Alexander Vilenkin, Director of Institute of Cosmology and L. and J. Bernstein Professor of Evolutionary Science at Tufts University. Prof. Vilenkin's current research interests cover a wide range of subtopics in cosmology, quantum field theory and gravitation: cosmic inflation, dark energy, cosmic strings and monopoles, quantum cosmology, high energy cosmic rays, the multiverse, anthropic selection etc. He received his undergraduate degree in physics in 1971 at Kharkov State University in the former Soviet Union. In 1976 he emigrated to USA and received his PhD at SUNY Buffalo in 1977. In 1978 he joined the faculty at Tufts. During what has been a very productive and creative span of last thirty-five years, Prof. Vilenkin wrote over 200 research papers and contributed some crucial components of modern cosmology. His work on cosmic strings has been pivotal and his ideas on 'eternal inflation' and 'quantum creation of the universe from nothing' paved the path for new fields of investigation. Occasionally, he also took time to work on condensed matter physics and even topics like statistical analysis of DNA sequences. His work has been featured in numerous newspaper and magazine articles all over the world, as well as in many popular books. Here is a link to a list of his published work: Google Scholar. Prof. Vilenkin is a Fellow of the American Physical Society. During 1984-89, he received Presidential Young Investigator award from National Science Foundation. 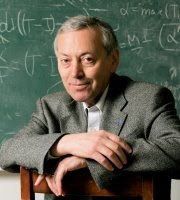 In 1994 he (with P. Shellard) wrote a monograph on "Cosmic Strings and Other Topological Defects" (Cambridge University Press, 1994). In 2006 he authored the well-acclaimed book "Many Worlds in One: The Search for Other Universes" (Hill & Wang, 2006) which has been translated into many languages. It gives us lot of pleasure for having the opportunity of presenting to you this list of 5 breakthroughs that Prof. Vilenkin would like to see in the field of Cosmology. 1. Cosmic superstrings. Some superstring inspired cosmological models predict the existence of fundamental strings of astronomical dimensions. Discovery of cosmic superstrings may be the only way to test superstring theory by direct observation. In fact, discovery of cosmic strings of any kind ("super" or not) would be a great breakthrough, since it will open new windows into particle physics of ultra-high energies and into the early universe cosmology. 2. Further evidence for inflation. We have substantial evidence for cosmic inflation, but the details are very uncertain and a large number of models are consistent with the data. Discovery of gravitational waves from inflation or of non-Gaussian features in the cosmic microwave background would be important breakthroughs in this area. 3. Evidence for the multiverse. Inflationary cosmology leads to the multiverse picture, with multiple "bubble universes" expanding and occasionally colliding with one another. Collisions of our bubble with others may have observational signatures in cosmic microwave background and in gravitational waves. A discovery of such a collision would provide a direct evidence for the existence of the multiverse. 4. Solution to the measure problem. This is a perplexing problem in inflationary cosmology. Inflation is generically eternal, and bubble universes like ours are constantly being produced. Anything that can happen will happen in the eternally inflating universe, and it will happen an infinite number of times. We have to learn how to compare these infinities, since otherwise we cannot distinguish probable events from highly improbable, which makes it hard to make any predictions at all. 5. Discovery of supersymmetry. Non-discovery at Large Hadron Collider (LHC) would also have important implications. You may be wondering why "dark energy" is not on my list. This is because I believe it is cosmological constant. But if I am wrong, and the dark energy density is changing with time, the discovery of this fact would be a great breakthrough. A well thought-out summary of the current status of cosmology from Prof. Vilenkin. However, I'm also wondering why dark matter did not find a place in his list. I feel LHC, with its complex set-up, would not be able to give us any new direction in near future. We must concentrate our efforts on cosmological observations to find such breakthroughs. No. 4 ('measure problem') seems to be most crucial of all breakthroughs needed. In the jungle of all kinds of problems that still exist in an inflationary scenerio, we often tend to set aside this most important task of calibration. Thanks to Prof. Vilenkin for such a nice summary. It would be nice to know Professor Vilenkin's thoughts about dark matter.